The pursuit of the world's most beautiful island has long been going on. But it seems that the search for it is over for those who already visited and stayed at Amanpulo Luxury Resort on Pamalican Island, Palawan. And that includes millionaires and A-listers such as Brad Pitt, Robert De Niro, Madonna, Beyonce, as well as Bill Gates! While it doesn't really claim the title, Amanpulo is hailed by travelers as one of, if not, the most beautiful island resort in the world. The 1.5 mile-long island located on Pamalican Island in Palawan boasts idyllic beaches with fine white sand and clearest waters under the sun. True to its name, Aman which is Sanskrit for peace and pulo which means island in Tagalog, Amanpulo or "peace island" is a quiet, exclusive escapade. It can only be reached through a private plane wherein you can bring your own or the hotel can arrange the 70-minute flight. Accommodation choices are 40 exclusive casitas and 11 private villas, each with a guest assistant that would professionally and friendly attend to your needs even before you ask for it. Each of the casitas has huge, comfortable beds, marble toilet and bath, outdoor shower, wooden deck, garden hammock, and other top-of-the-line furnishings. The more luxurious private villas, meanwhile, comes with a private beach access. The world-class amenities include a clubhouse with an enormous swimming pool, tree-top spa, lagoon bar, a separate beach bar, three tennis courts, and a gym. Moreover, sumptuous food made from locally-caught seafood and fresh vegetables awaits at the Clubhouse Restaurant. 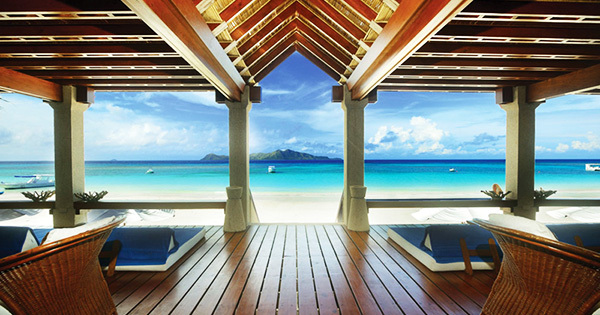 No wonder VIPs from around the world love Amanpulo. Though it is relatively expensive, what you'll get is a luxurious, remarkable experience.